We are honored to be participating in the BRIC Biennial: Volume III, South Brooklyn Edition!! BRIC invited us along with NARS Foundation, Ortega Y Gasset Projects, Trestle Gallery and Greenwood Cemetery to participate, highlighting the significance of Brooklyn as a place where artists create work and develop their careers. 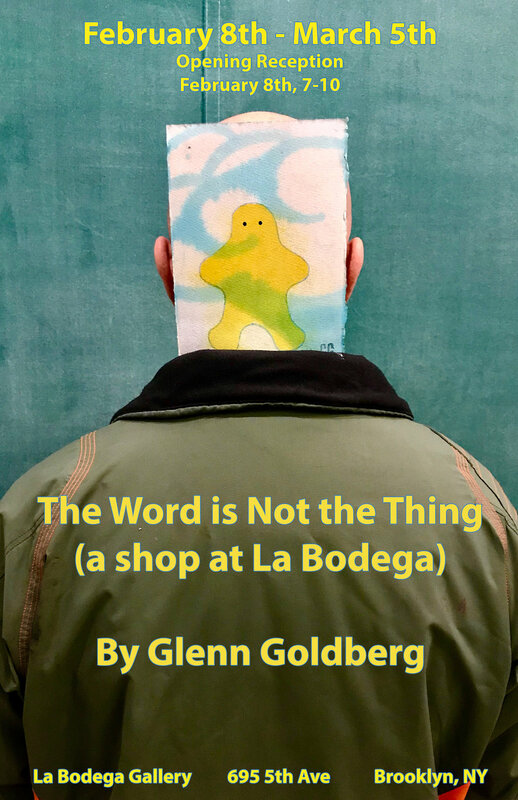 For this we are beyond excited to have the incredible artist Glenn Golberg showcasing work he made in conjunction with La Bodega Art Space and Gallery.The Word Is Not the Thing (A Shop at La Bodega) comprises a series of multiple objects and prints by artist Glenn Goldberg, many made in conjunction with La Bodega Gallery and Art Space in their community studio. Rather than mount a traditional exhibition, the energy and nature of La Bodega encouraged Goldberg to transform the gallery into a shop with works born out of collaboration. Many of the printed works were made with La Bodega’s owner, Miguel Ayuso and some of the multiple cast objects were conceived with La Bodega’s gallery director, Johnny Thornton. Goldberg saw this as an opportunity to use his partnership with La Bodega to echo its mission of community action. Goldberg’s characteristic use of iconography, textiles, and devotional objects are present in these works.